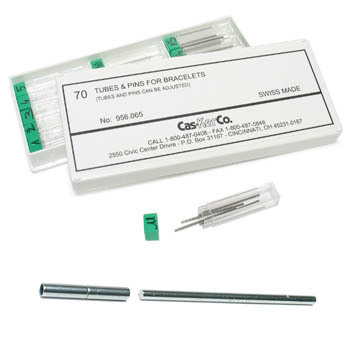 Five each Friction Fit Watch Bracelet Tubes and Pins, 70 pieces total. Tubes are 12mm long and Pins are 30mm long. Tubes are 12mm long and diameters: 1.00 1.10 1.20 1.30 1.40 1.50 and 1.80. Pins are 30mm long and diameters: 0.70 0.80 0.90 1.00 1.10 1.20 and 1.50. Tubes and pins can be adjusted. 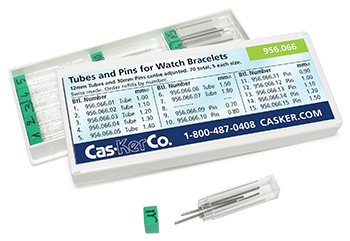 Most watch parts and assortment orders ship the day your order is received. For small parts orders under $50, select First Class Mail at checkout for the most economical shipping option. Typical delivery time is 1 to 4 days, depending on destination.